WALNUT - reSAWN TIMBER co.
reSAWN TIMBER co.’s WALNUT collection features wide plank north american black walnut wood interior wall cladding and flooring that is prefinished and available in solid & engineered construction. 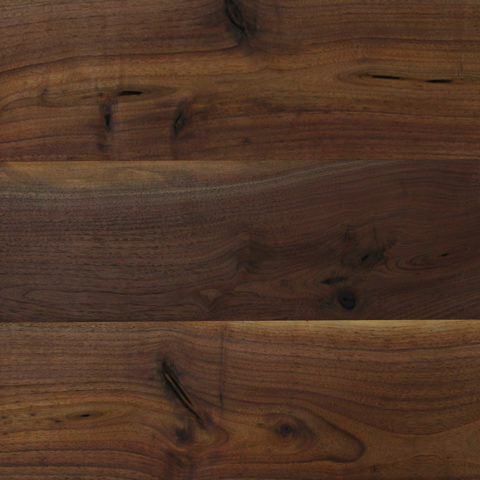 These designs emphasize the natural color & beauty of black walnut. All designs are available as FSC ® upon request. Mostly straight and open, but some boards have burled or curly grain. The process of steaming walnut involves putting the freshly sawn lumber (tight-piled and not stickered for drying) into a chamber. The wet wood is injected with wet steam in a chamber to achieve a temperature around 200′ F. Wood exposed to such heat will oxidize rapidly, and a darker color will develop in both the heartwood and the sapwood. Additionally, the heat will cause the air within the wood to expand and push dark colored water out of the wood, which adds further rich walnut color to the light sapwood. reSAWN’s black walnut products utilize the steaming process to darken lighter sapwood. Steamed walnut creates a deep, rich walnut tone, and the resulting product has a more even monochromatic brown aesthetic across heartwood and sapwood. In addition to steaming, reSAWN specializes in various finishing techniques that highlight the natural beauty of black walnut. The following products are offered as steamed: WILLIAMSPORT, WESTPORT, BELLEPORT, STOCKPORT, ROCKPORT, and LONGPORT. Unsteamed black walnut creates a greater color variation between lighter sapwood and darker heartwood. The lighter color of the sapwood is present on the outer edges of a plank, and leads to a more dramatic color contrast and characteristic. reSAWN offers the following unsteamed black walnut products: BRIDGEPORT and HARBOR.